Finally, the winter has past and the season of the farmer’s markets is upon us. Make great use of the early veggie season with this awesome pizza recipe. Fresh ripe tomatoes from the vine and a little fragrant basil makes this pizza top notch. I can’t wait for you to try it tonight. Preheat your oven to 400. Prep cheese, tomato and garlic. Remove the pizza dough from the frig. Make sure to keep it cold until you are ready to work with it. Coat the bottom and top of the dough with a small amount of corn meal – This will allow you to stretch out the dough without it becoming sticky. Stretch out (or roll with rolling pin) your dough to your desired thickness and shape. I like to do a thinner crust in a rectangle shape – be creative! Go slow, one section at a time. Once you get the shape that you like, spray a baking sheet with non stick spray and place your dough on it. Drizzle olive oil all over the dough and sprinkle on garlic. Bake in the oven for about 5 minutes. 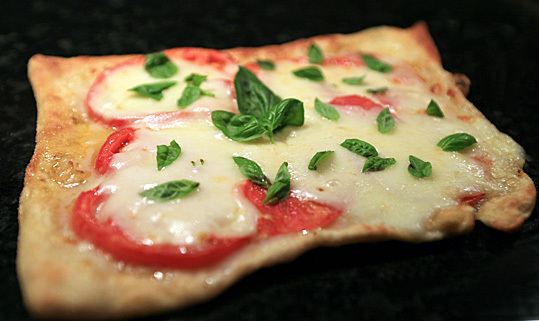 Remove the dough and arrange tomato slices on the pizza. Season with salt and pepper. Arrange mozzarella on top and place back in the oven for 7-10 minutes. Allow the cheese to slightly melt and brown. Garnish pizza with your small leaves of basil. Can’t find small leaves? Make basil confetti: Stack 3-4 basil leaves on top of each other and roll them together like you are making a basil cigarette. Slice the roll into several large ribbons. There you have it - basil confetti. Eat and enjoy! Let me know your thoughts in the comments below. That looks soooo yummy. I want one now!